FTI Technology’s Ringtail Certification Program offers training and official certification for the award winning Ringtail e-discovery software platform. Designed to help document review professionals both acquire and demonstrate mastery of all facets of Ringtail’s powerful document review capabilities this certification is a valuable addition to your resume. 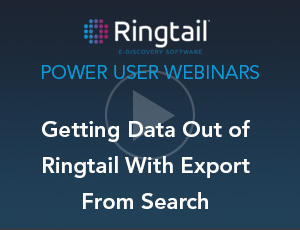 Whether working on early case assessments, investigations or high stakes litigation, being Ringtail certified means you have the knowledge and experience to quickly and accurately review documents, build and execute keyword searches, leverage concept clustering via Document Mapper and accurately code and redact documents.